Jes Camilleri reviews Joan, a Drachma LGBTI/Milk Presents production recently put up at Spazju Kreattiv. Lucy Jane Parkinson in Joan. Drachma LGBTI, a local NGO that focuses on integrating spirituality with sexual orientation, together with the UK theatrical company Milk Presents, were behind the wonderful production titled Joan that was recently performed at Spazju Kreattiv. 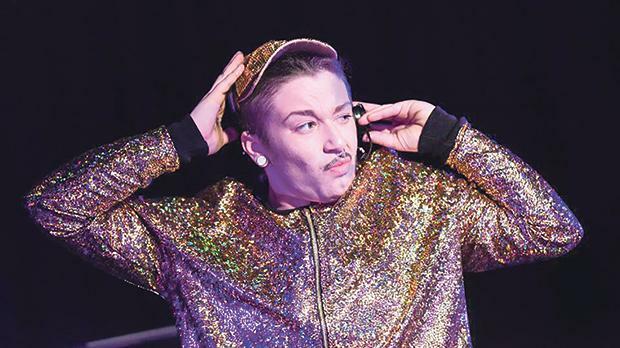 The show had a sold-out run at the Edinburgh Fringe Festival and is a bravura act for Lucy Jane Parkinson (also known to UK audiences as LoUis CYfer, one of the UK’s foremost drag kings), who plays all the characters in the show and adds more than a tinge of cabaret and vaudeville to the proceedings. Written and directed by Lucy J. Skilbeck, the production parallels the life of Joan of Arc with that of the performer. We see Joan of Arc, under the guidance of St Catherine, maturing from a peasant girl into a fearless leader of the French army in her quest to liberate her people from the English. Simultaneously, we also see the performer developing from an awkward, working class teenager who does not fit into the gender stereotypes dictated by the people around her into a strong, self-assured woman. Through the hour-long show, Parkinson skilfully uses her own story to portray the heroic endeavours of a woman who was possibly the world’s first gender warrior. Despite the fact that Joan of Arc felt that she had to dress like a man to be taken seriously, she persisted in her quest thanks to her strong vision and unwavering purpose in life. I was particularly impressed with Parkinson’s skill and energy as she portrayed various male personas in the two narratives – her father, played as a rough yet kind-hearted Englishman; the French Dauphin played as a camp, disco aficionado; and Joan’s prosecutor, Pierre Cauchon, played for laughs thanks to some hilarious use of fake facial hair. The text skilfully fuses the comic with the tragic and is delivered directly to the audience. This is where Parkinson’s experience as a cabaret entertainer really comes in useful. On the night I watched the performance, she not only managed to get various members of the audience to help out in recreating some tricky scenes but also beautifully handled a member of the audience who was more intent on checking his phone than on following the show. By juggling the two narratives, the script vividly reminds us that, although more than 500 years have passed since Joan of Arc was burned at the stake for refusing to conform, those who don’t fit the gender binary model face a similar fate today. This production celebrates bravery, yet reminds us that the struggle is still on.